I found this week to be a good time to delve into a little bit of everything. The hooking in the second of the cone series was started this afternoon. Some wool was dyed and some I was lucky enough to find on the studio shelves. The top of the cone section will be yellow and green then shift to rust and brown at the bottom. Dark and medium grays will go into the right hand background and medium and light grays in the left hand background. 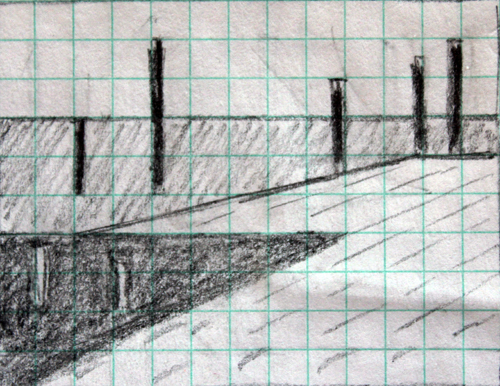 I am continuing to delve into geometrics inspired by plein air study. The above work developed from viewing a tree against the moon and clouds at night. 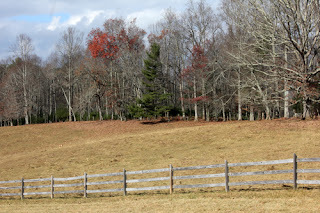 The work could be hung a variety of ways including horizontally as above or vertically as seen below. I would have included a sketch of the scene done realistically, but unbelievably I am using the excuse that the cat shredded the sketch. She also has broken two vases. Yes, she is still alive and well. Just too cute to get mad at. I will be discussing using plein air to create abstracts as part of "The Art of Plein Air" class at Green Mountain Rug School in June. The third in the series is a sketch I made in Florida. 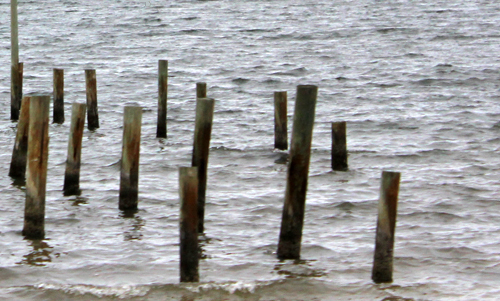 It continues my current interest in wood pilings on the water. 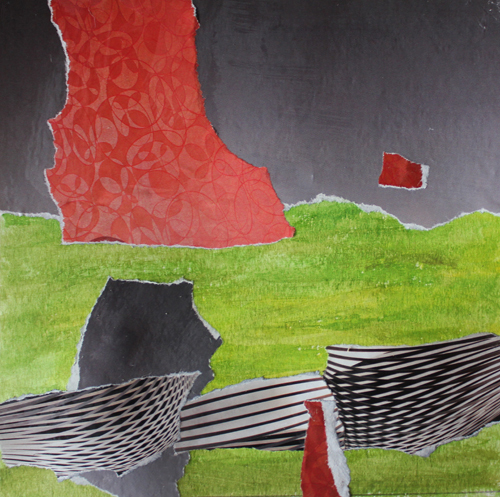 While clearly abstract it is easier to see the subject matter of this piece than that of "Geoscape II". Will the colors chosen affect that perception? While preparing for class I am reading works by some artists that are not thought of for plein air work but created them at some point in their art career. 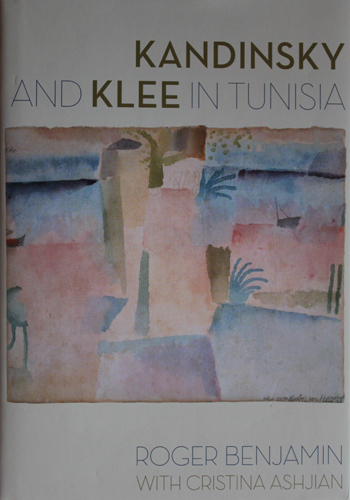 This book takes the reader through the adventures Wassily Kandinsky and Paul Klee had while creating work in Tunisia. Klee's plein air work there led to his increased interest in color. This interest in turn led Klee to turn more and more toward abstraction. A Happy New Year to all. Join me in continuing to love, view and create art in 2017. GEOMETRIC TEXTILE WORK AND A MERRY CHRISTMAS TO ALL! This is the last work that will be completed in 2016. It developed from the study of shadow in a plein air sketch. 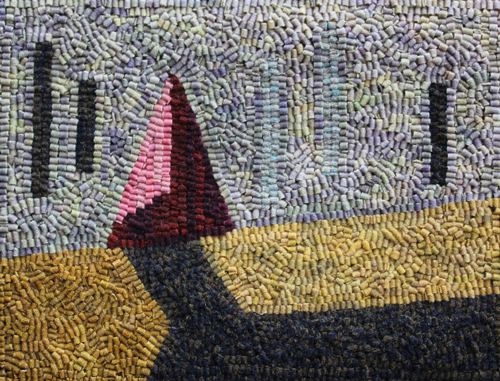 Various values of gold, red, purple, brown and blue gray were used. The straight lines of blue gray to the right of the red are close in value to the background and almost hidden. 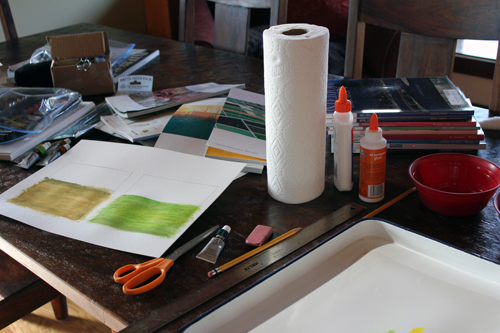 I look forward to using plein air in a way that develops my geometric work and moves it forward. The outdoors offers so much to see in our own way! Thank you to all the blog readers of "In the Studio and Elsewhere". You keep me on my toes and I look forward to seeing what the new year brings. 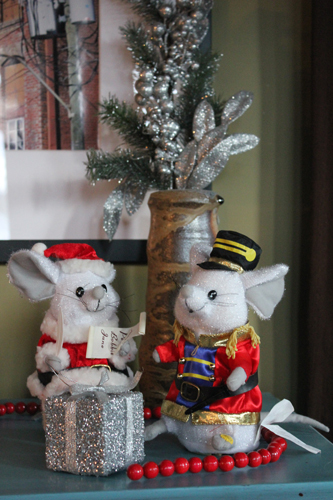 A VERY MERRY CHRISTMAS AND NEW YEAR FROM OUR HOUSE TO YOURS! We moved our son to Florida this past week. Many of our relatives have moved down to the warmer climate and we had a chance to visit some of them while there. 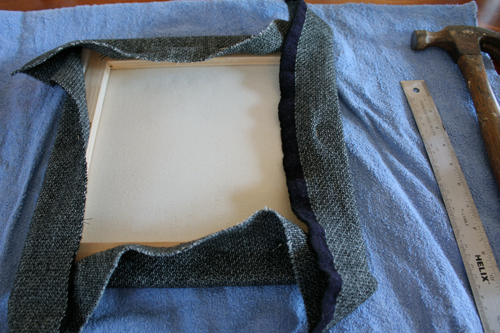 When we returned, I completed whipping edges and mounting "Directions". As the work is in four sections, it can easily be arranged in various positions. There were some wonderful ideas for artwork in Florida. The trunks of the palm trees criss-crossed forming light and shadow. The rough texture could easily be depicted with textured wool or yarn. These trees lend themselves to both abstract and realism. Color, color, color. We saw loads of both pastels and saturated color. Pink, yellow, blue, green, turquoise, black, white and gray of various values are all seen in the photo above. Patterns of X's decorate the pink building and vertical lines can be seen in the balcony and roofing. These are a favorite of mine. 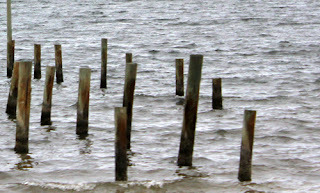 I love the way the various heights of the pilings protrude from the water, the various shades of color in them from the battering of the sun and the sea, the spacing between them and how the light hits each one A subject I will work with in the future in abstract form. 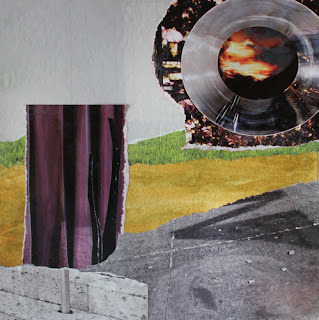 I decided to take a break from hooked work over the holiday and pull out paper, paints and old magazines to try out some collage ideas. 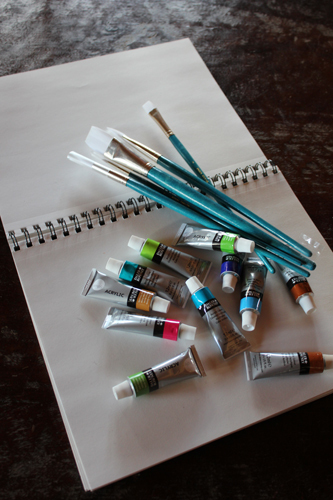 When experimenting I tend to use lower cost supplies High-end paints and brushes can be quite expensive so I save them for final projects. Archival quality products should be used for works that will be shown, sold or expected to last over time. I painted about two thirds of each 6" square with paint. 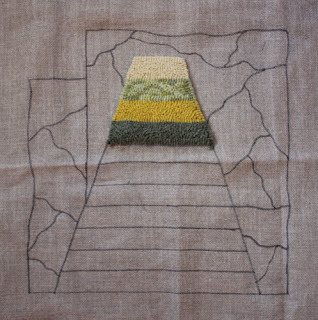 Here I chose a mix of yellows and browns for one square and yellows and greens for the other. I have tons of magazines on hand dating back to 2010 so I had plenty to choose from. 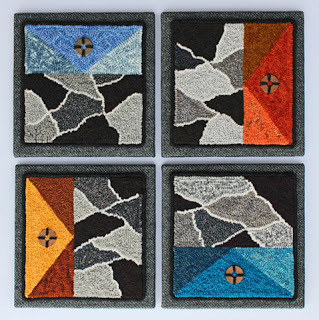 The work above has grays mixed with patches of bright color and it has a minimalistic look to it. Looking out our bay window I could see some trees still had the color of fall on them I tore sections of color from the magazines rather than cut them as I liked the ragged look it left. It also leaves a touch of white on the edges of the paper as it tears. 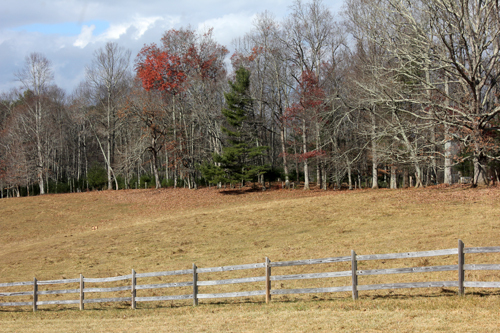 From viewing the two above photos it is easy to see how a realistic scene can become abstracted. A section of gray wood on the bottom left shows the deck while the purple curtain is placed in the foreground. Beyond the curtain are painted gold fields and collaged green hills leading to an expanse of gray sky with no mountains in sight. The upper right shows the fire raging in the mountains. Recent fires in the area have left us spending quite a bit of time indoors as breathing was difficult when winds picked up. 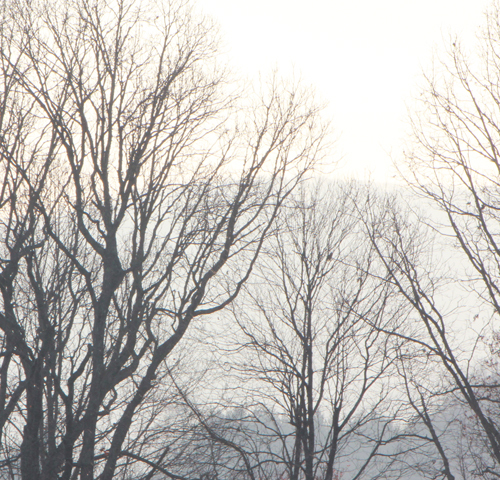 We could see smoke spread across the mountains, which were barely visible for days. It was interesting to see how a different medium affected my design aesthetic. I found myself using rougher edges and veering from my usual geometric style while working. It is a freeing medium with a lot of possibilities and I expect to continue working with it. Try a different medium. Collage, paint, colored pencils, watercolor, clay, assemblage or other and see how it affects your style. Did you learn anything about yourself or the way you approach your artwork?